PlanOn System Solutions has launched what it claims is the world's smallest full page colour scanner. 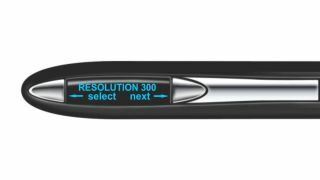 According to the US-based company, the pen-sized ScanStik SK600V can scan a whole page at once in a similar manner to a flatbed scanner, rather than at one line at a time. It houses a rechargeable battery, USB connector, microphone, speaker and Bluetooth connectivity, and can transfer scans in seconds to smartphones, tablets and PCs with an optional USB cable. With ability to scan in resolutions of 150, 300 and 600DPI, it features 24-bit Color JPG and black and white TIF scanning modes and is bundled with PaperPort SE image editing software. The device also features a MicroSD memory slot that holds 1000s of image scans with up to 600dpi resolution in colour or black and white. PlanOn Systems is targeting the ScanStik SK600V at mobile professionals, salespeople needing to scan IDs and documents on the road, travelling business people on holiday and employees that work in home offices. It's out now and is priced at US$249 (about £164).